Dubai, UAE, September 12, 2018: The 2018 OMEGA European Masters have ended in Crans-Montana with victory for Matthew Fitzpatrick of England. This is the 18th year that OMEGA has title-sponsored the competition and the brand was thrilled to watch as Matthew Fitzpatrick played through the tournament's final day to take home the winner’s check, trophy, red championship jacket and an OMEGA Seamaster Aqua Terra 150M Master Chronometer. The 41mm watch features a symmetrical 18K Sedna™ gold case and a sun-brushed brown dial with a distinctive horizontal “teak” pattern. There is also a date window at 6 o'clock and 18K Sedna™ gold hands and indexes filled with white Super-LumiNova. Presented on a brown leather strap, the timepiece is powered by the OMEGA Master Chronometer calibre 8901, certified at the industry’s highest standard for precision and performance by the Swiss Federal Institute of Metrology (METAS). The final round of the tournament on Sunday also began with a special announcement from OMEGA, revealing that the 2019 OMEGA Masters will feature the brand’s three male golfing ambassadors, Rory McIlroy, Sergio Garcia and Tommy Fleetwood. Placed amongst the very best players in the world, they will certainly be an exciting trio to watch and OMEGA is looking forward to welcoming them to Crans-Montana next year. Originally known as “The Swiss Open”, the OMEGA European Masters is renowned for its heritage, famed winners and majestic mountain scenery that delights players and spectators every year. 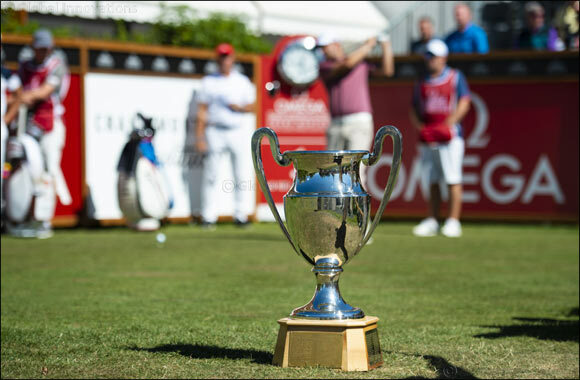 Although it was first played in 1923, this prestigious competition has been title sponsored by OMEGA since 2001. Taking place in Switzerland, it is a proud “home advantage” for the brand.